It’s national margarita day so I’m going to tell you how to make the best one person serving of oatmeal. Sure that doesn’t seem to make sense but you can’t have a margarita for breakfast can you? Start the morning off right with a delicious warm breakfast and your stomach will be set up for a tequila based celebration in the evening (or noon-ish — no judgement). A week or so ago my friend mentioned to me that she was trying to eat healthier and switched to oatmeal for breakfast. Although she likes it she isn’t happy that it is sometimes mushy. I realized later that I should have shared my oatmeal making technique so instead I’m sharing it with all of you! To be honest I read how to make oatmeal this way on a blog years ago, but I can’t remember exactly where so let’s just pretend it all came from my genius brain. Ignore the instructions on the back of the cylindar container and do this instead. Full disclaimer – I really like oats. If a recipe calls for oats I’m adding a double batch. If a recipe doesn’t call for oats there is a good chance I’m adding them anyway (ex: Nutella Cookie here – http://wp.me/p159Ee-89). You won’t like this unless you like oats but if you don’t like oats why are you even thinking about eating oatmeal … weirdo! Step 1. – Grab yourself a mug, Disney character optional, and fill it a tiny bit with water. Just a bit (up to my finger in the picture). Step 2. – Stick that baby into the microwave and heat for 60-90 seconds. Yes, my microwave is on top of my fridge. Yes, that does make it sometimes difficult to deal with. I didn’t judge you for drinking at noon, back off! Of course this is just one way to get some hot water in a mug but there are other options. Turning up your water heater really high and just waiting for the water out of the tap to get super-duper hot is an option. Waiting until you get to your office and then using that pre-hot water nozel thing that is oddly difficult to figure out, is an option. Going old school and using a kettle is an option. Whatever tickles your fancy will work just fine. Step 3. – Grab some oats. DON’T use the instant oats. Instant oats are disgusting. Those single bag instant servings are disgusting. 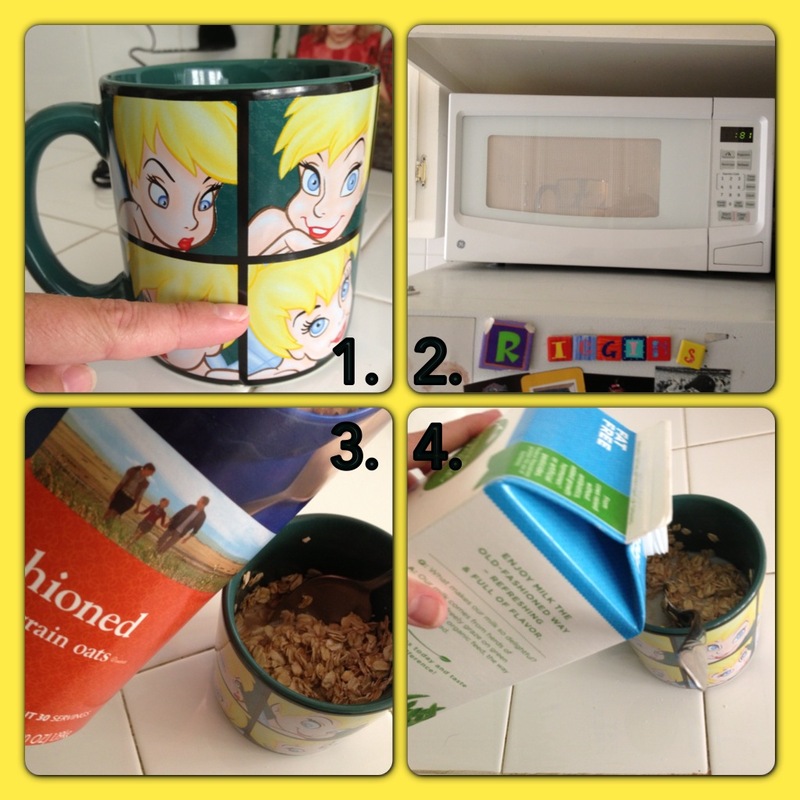 Grab real whole oats and spoon them into your mug until you have enough that they almost reach the top of the water. Then stir them some, leave them be for a while (doesn’t have to be long, go get your step 4 ingredients ready), then stir them some more. Step 4. – Add whatever yummies you feel you and your oatmeal deserve. Milk (Hot tip for single folks or folks that think milk is gross and don’t use it that often, I fall into both of these categories, buy organic milk and it will last longer. Seems counterintuitive but it’s true), brown sugar, regular sugar, raisins (Not my go to as my house is a raisin/grape free zone. These food items are very dangerous for dogs. Something in the raisin, and grape although less horrible, causes dogs kidney’s to shut down and renal failure. There is no real treatment and they don’t even really know why it happens. If a dog eats raisins the only option is to get them to throw up as much as possible then put them on an IV for 24-48 hours in the hope that you can flush out enough of the bad stuff before it causes real damage. I know this because I have a large vet bill with this treatment on it. ), pieces of apple, berries, or my favorite milk chocolate chips all add a yummy punch to your already delicious meal! There you go as simple as one, two and three (and four). No need to eat mushy oatmeal ever again. “But Wendy,” you say, “isn’t this just the same way you make instant oatmeal but instead you are using non-instant oats?” Yes. I realize it doesn’t seem like it can make that big of a difference but it does. Try it and let me know. Long rendition of quick oatmeal! Raisins are gross. Hot raisins are grosser. Just thought I’d point that out for no reason. I like raisins. Oatmeal raisin cookies …. delicious!!! !